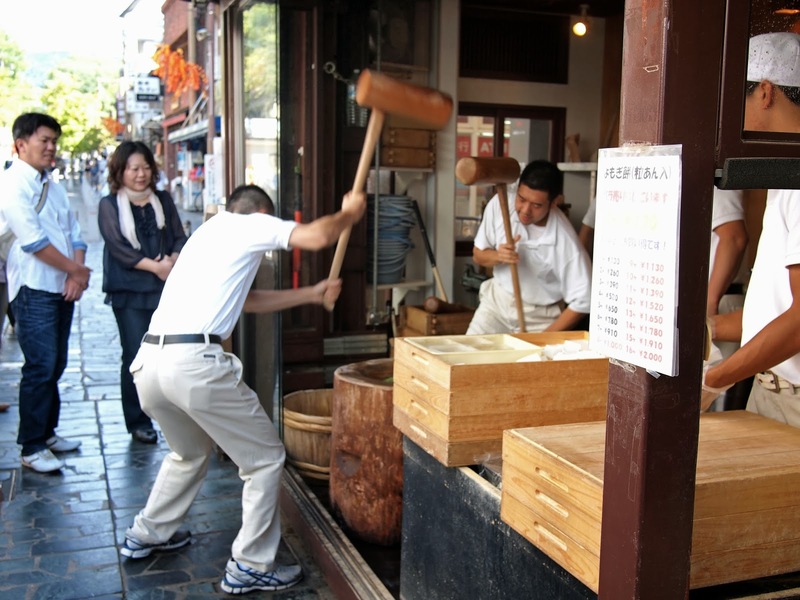 I'm on a roll, I tell you what! The weather has been absolutely beautiful, making it really easy to get out and explore every weekend. 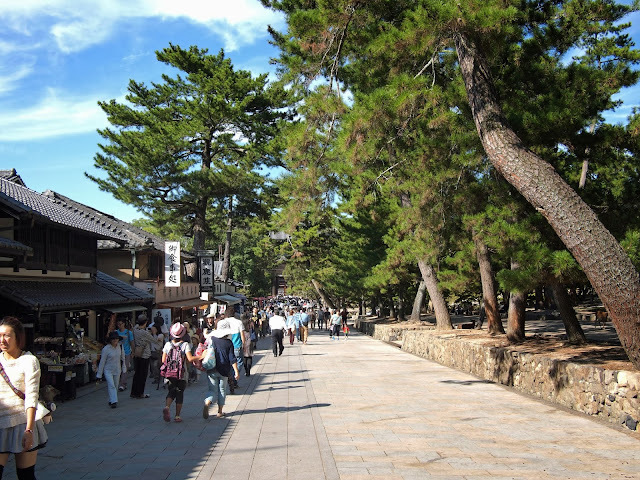 Last weekend I visited Nara, a small city about 45 minutes south of Kyoto. 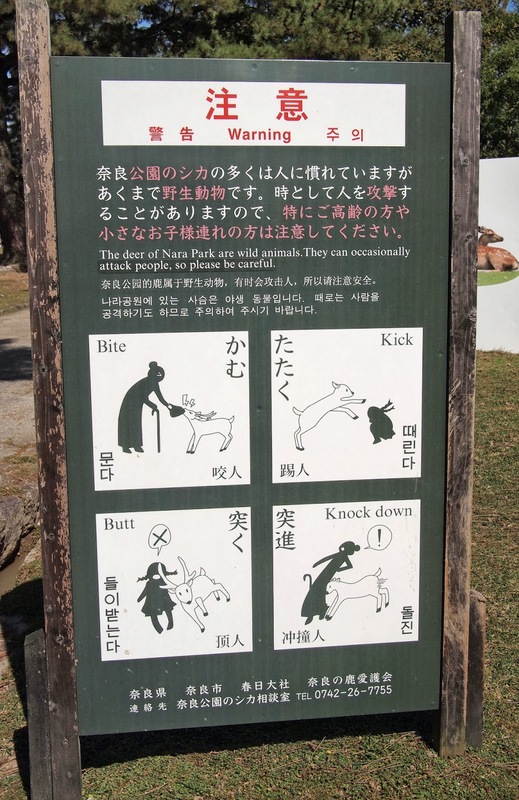 My co-worker, Alison was looking for something to do with her daughter over the weekend, so I invited them to tag along. 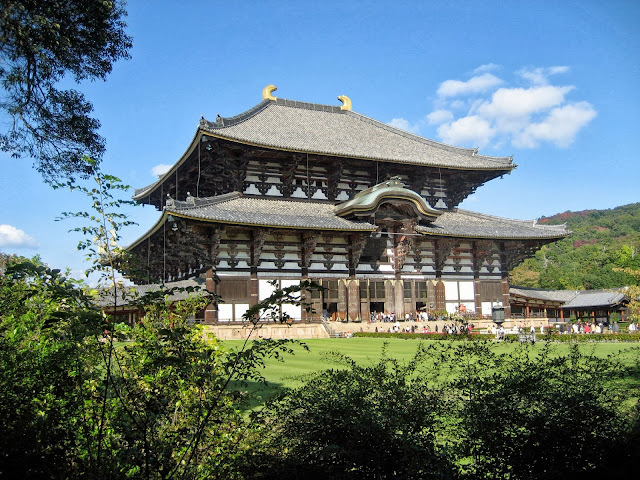 Nara was the capital of Japan during the Nara Period, from 710 - 784 (that was a loooong time ago!). 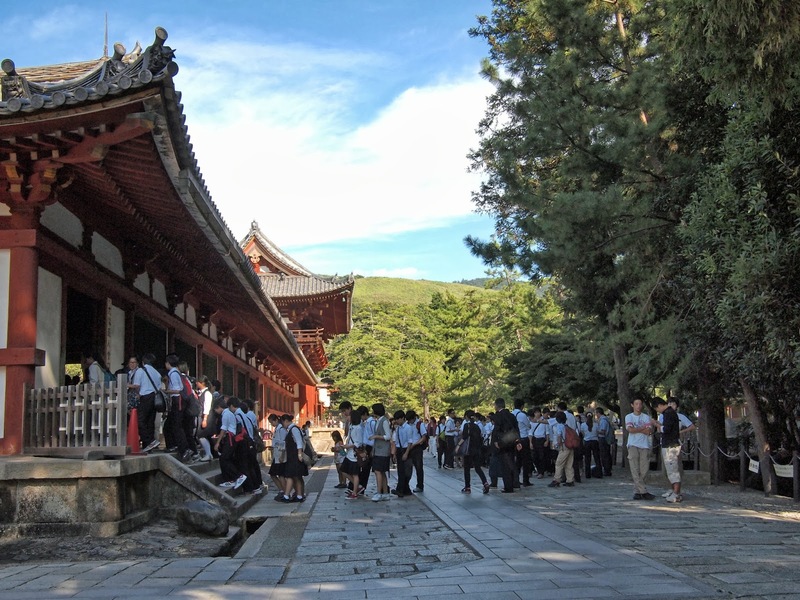 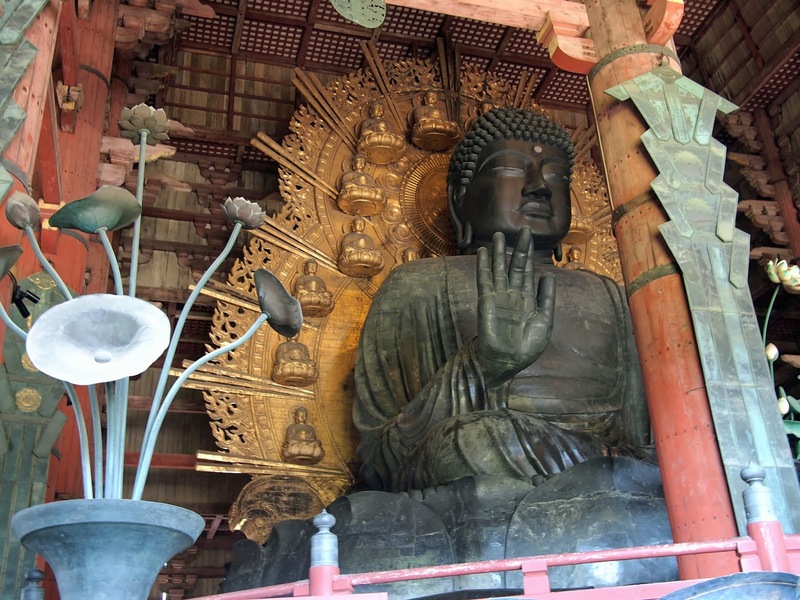 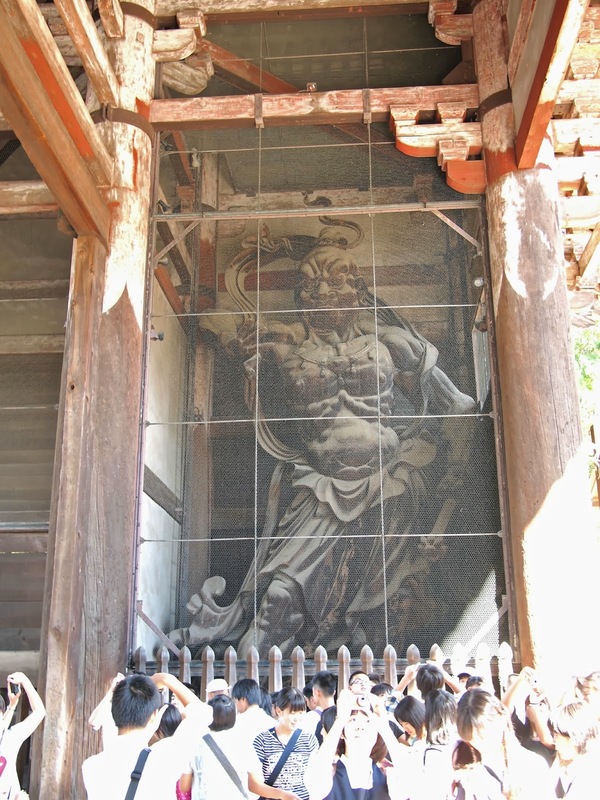 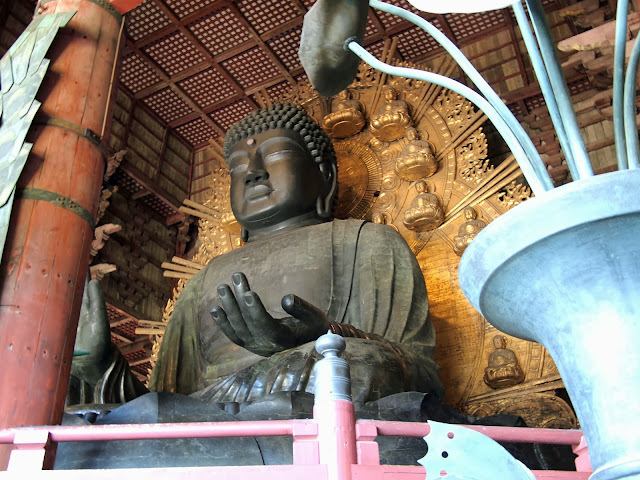 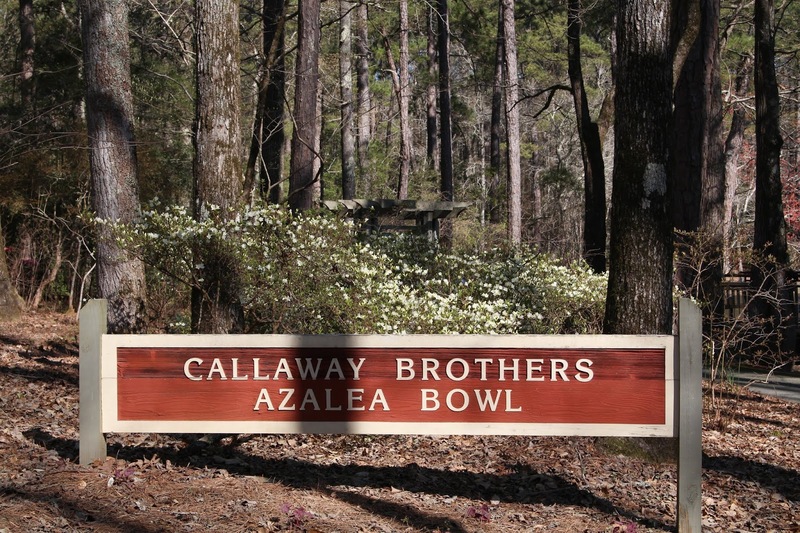 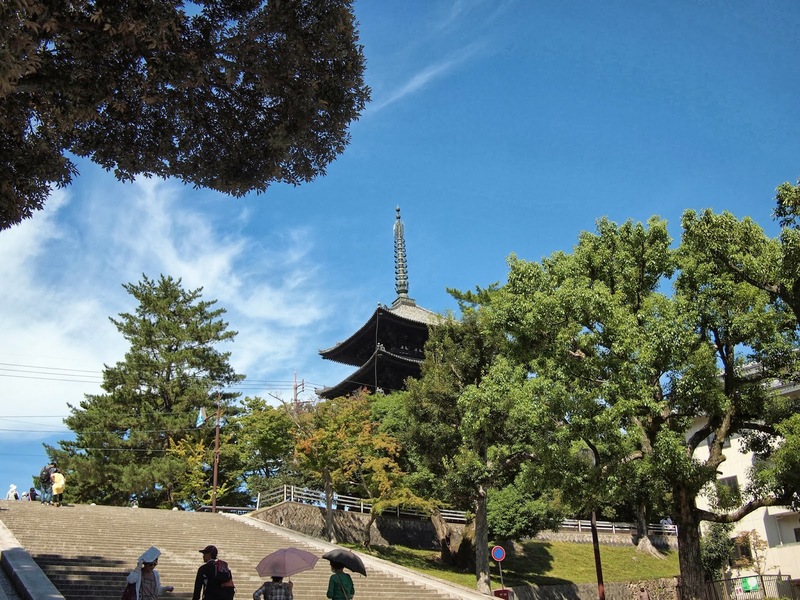 Now, it's a Japan tourist's must-see, as it is home to some of Japan's most famous shrines and Temples. 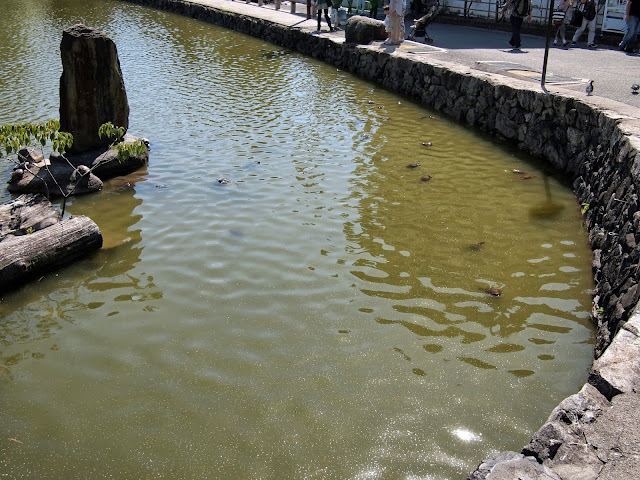 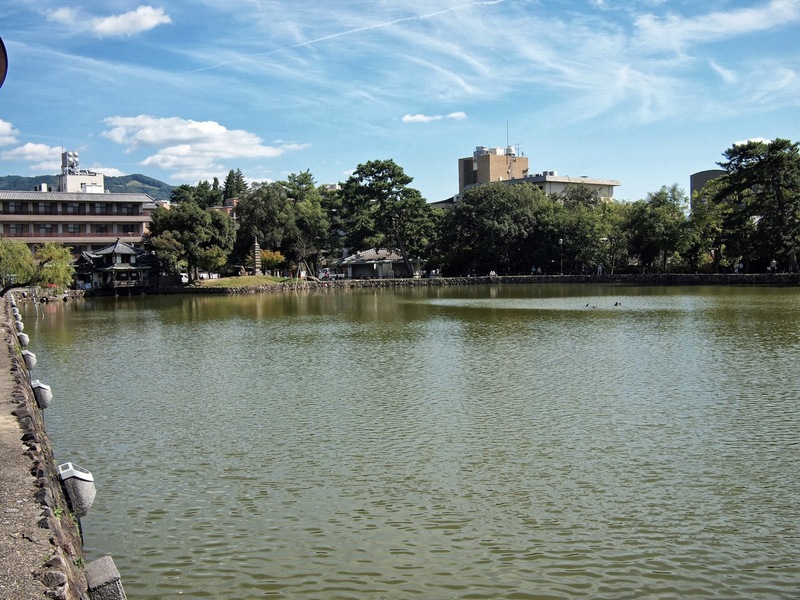 We started meandering toward Nara Park, the home to most of the famous temples and shrines, walking past a pretty pond absolutely full to turtles basking in the sun. 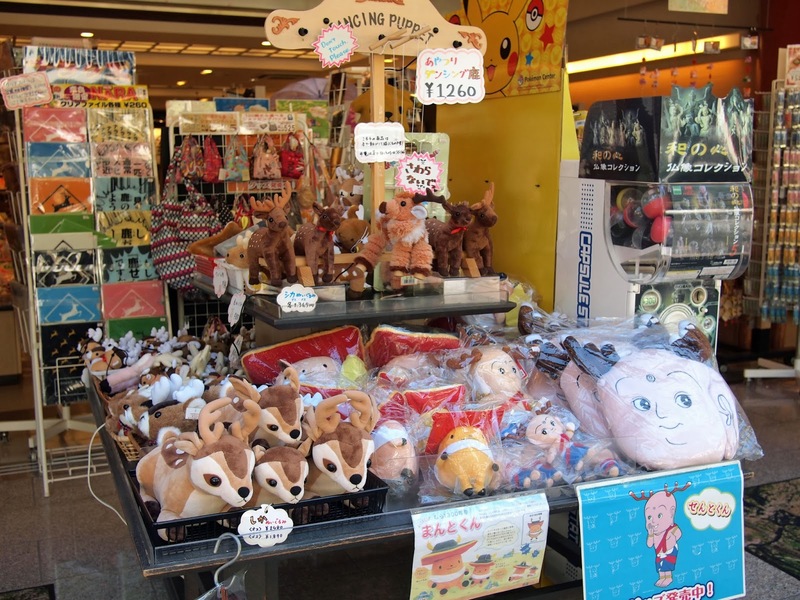 There is no shortage of tourist shops! We kept going past the pond and shops, and up the stairs to Kofuku-ji, one of the ancient Buddhist temples. 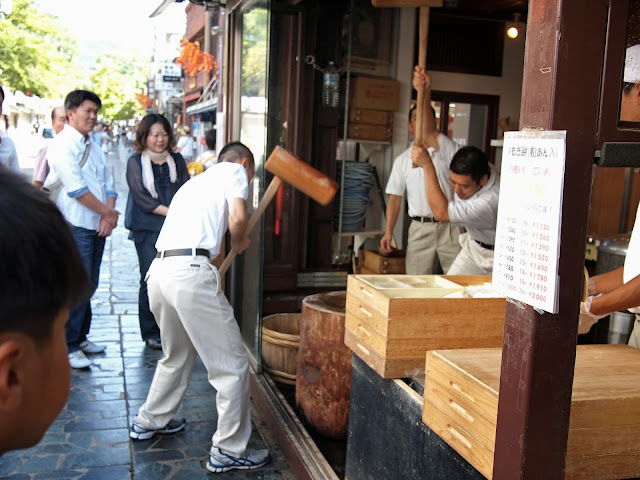 There was a kendo demonstration going on outside. This is Sento-kun, the Nara mascot. 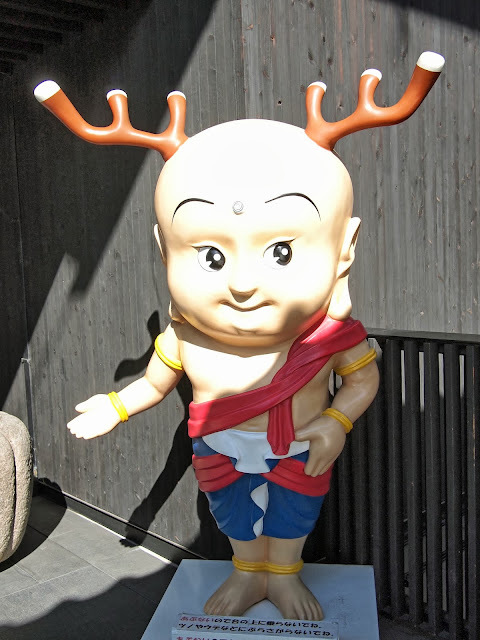 Half Buddha and half deer, he is everywhere. 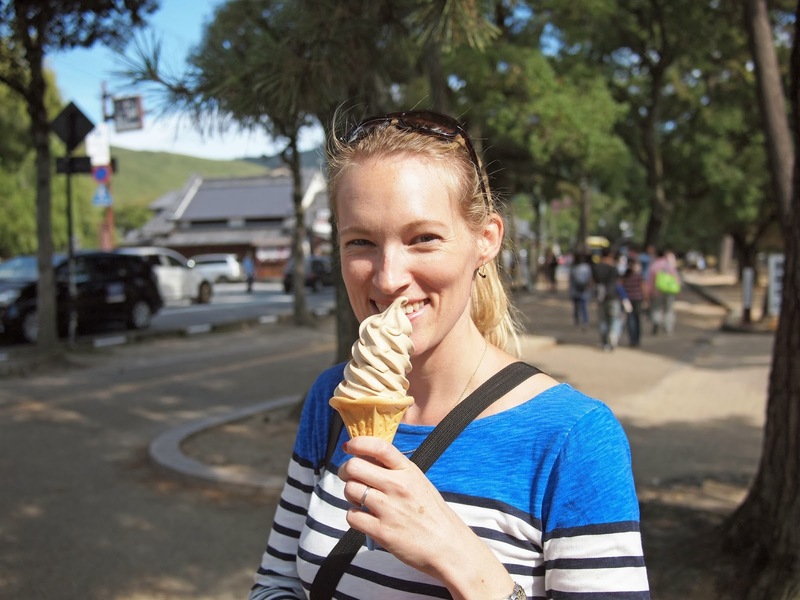 When you come across a food truck selling miso flavored ice cream, it must be tried!! 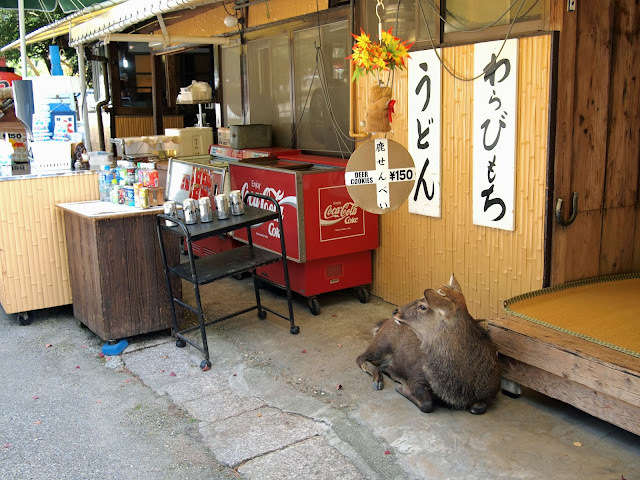 This one tasted more like caramel than miso, but maybe that's a good thing?! 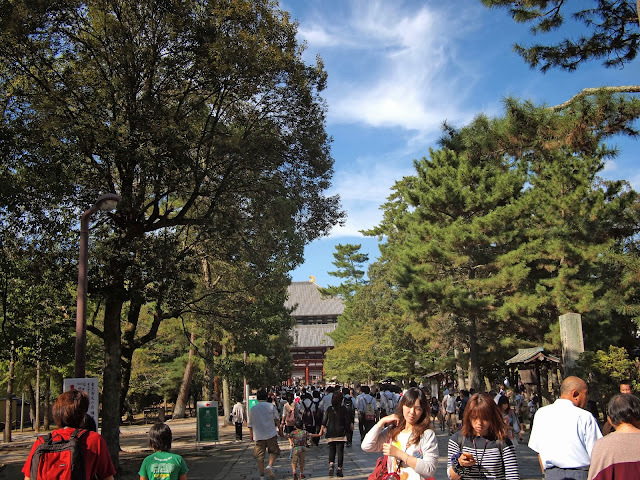 Continue through the park, past the ice cream truck, and you'll eventually find the path leading to Todai-ji. There are stands all along the way selling "Shika Sembei" (deer cookies) to feed the thousands (hundreds?) of deer that live on the grounds. (Be sure to watch where you step!) 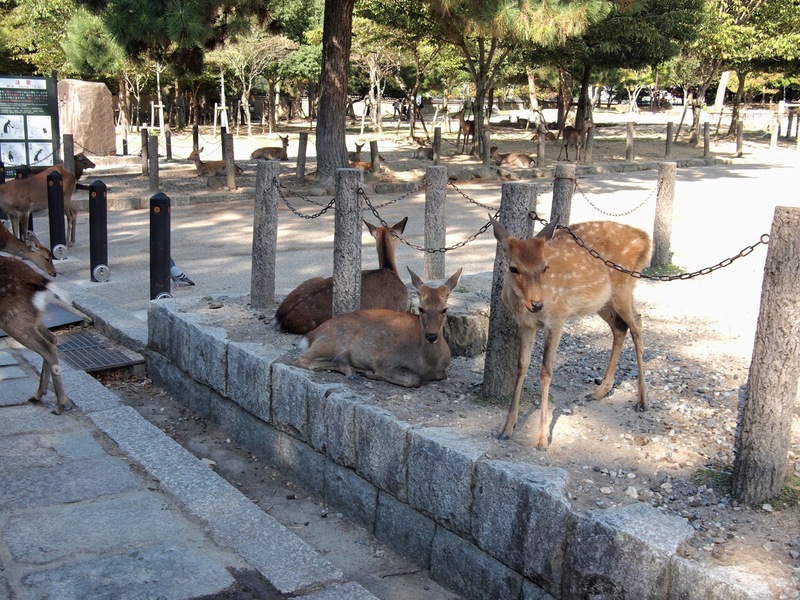 The deer are considered heavenly creatures, and protected by the government, and they are anything but shy. 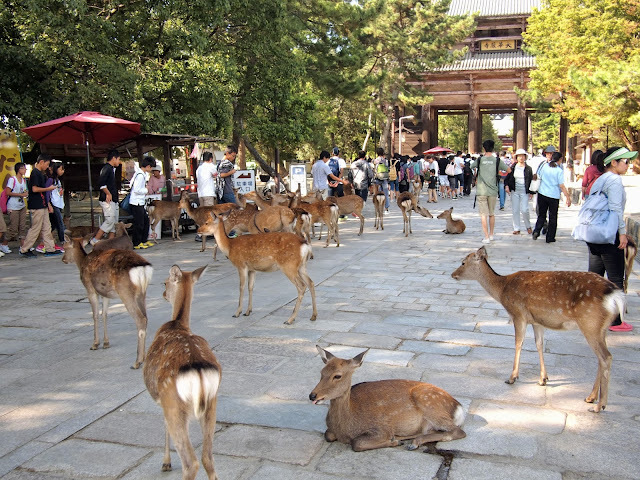 Word to the wise: if you don't fancy having loads of greedy deer chase you, steer clear of the shika sembei. 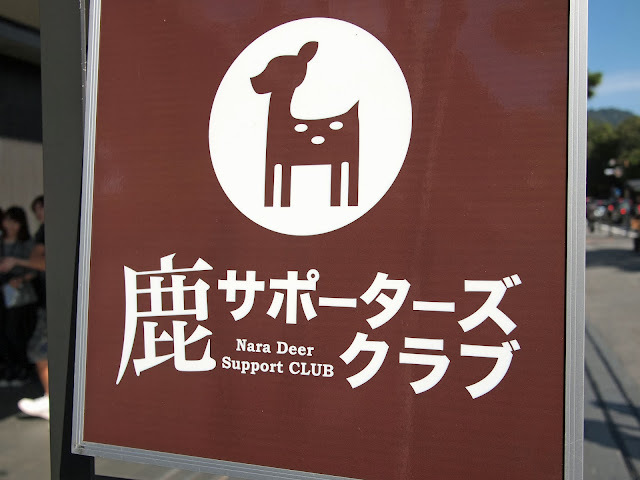 There's even a deer support club! 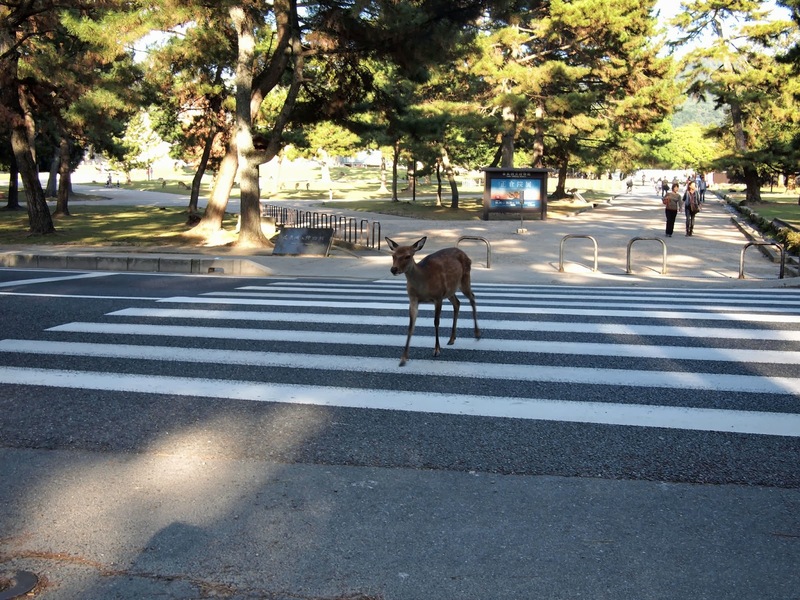 They even cross at the crosswalks, and wait for the signal to walk! 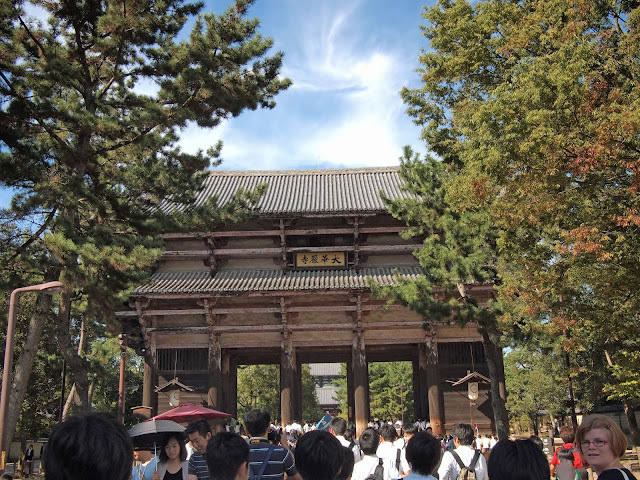 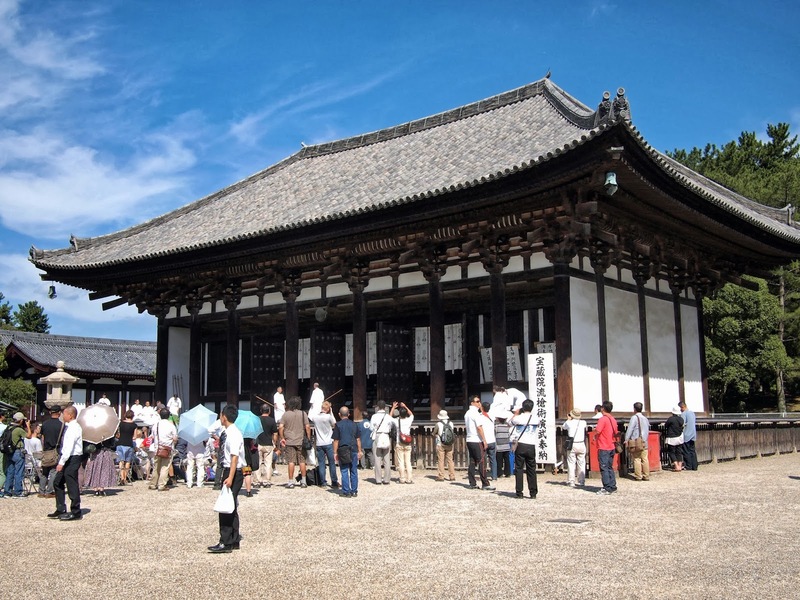 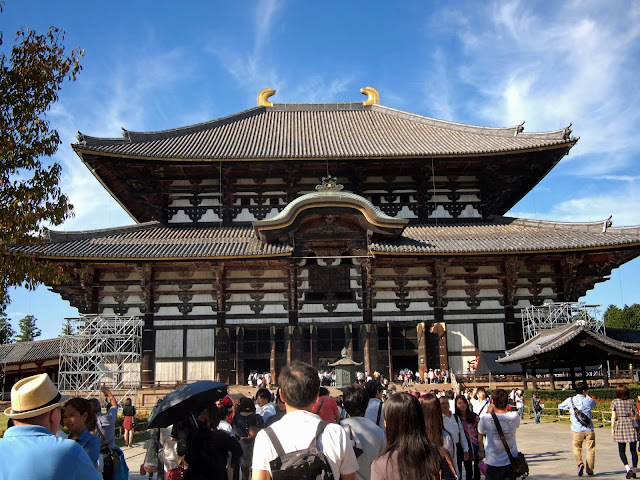 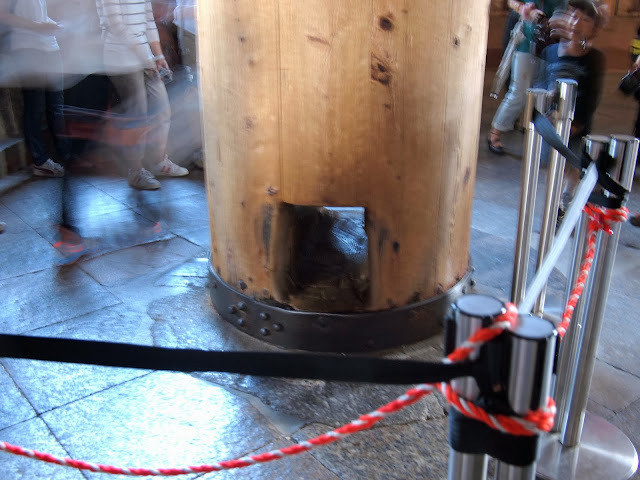 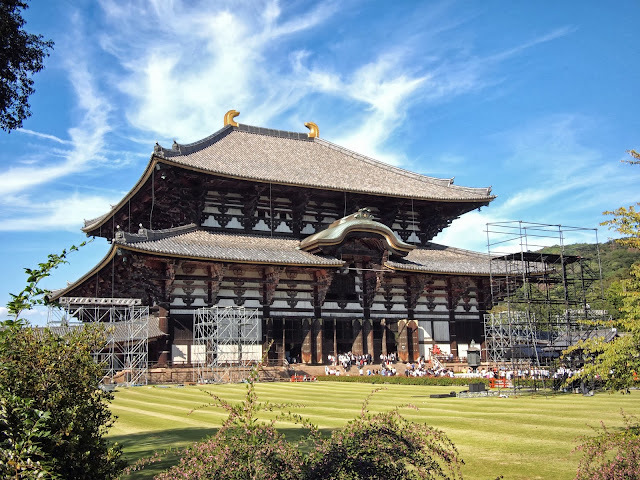 It claims to be the largest wooden structure in the world, even though it is 33% smaller than the original (this one is a 3rd generation building, built in the Edo period). 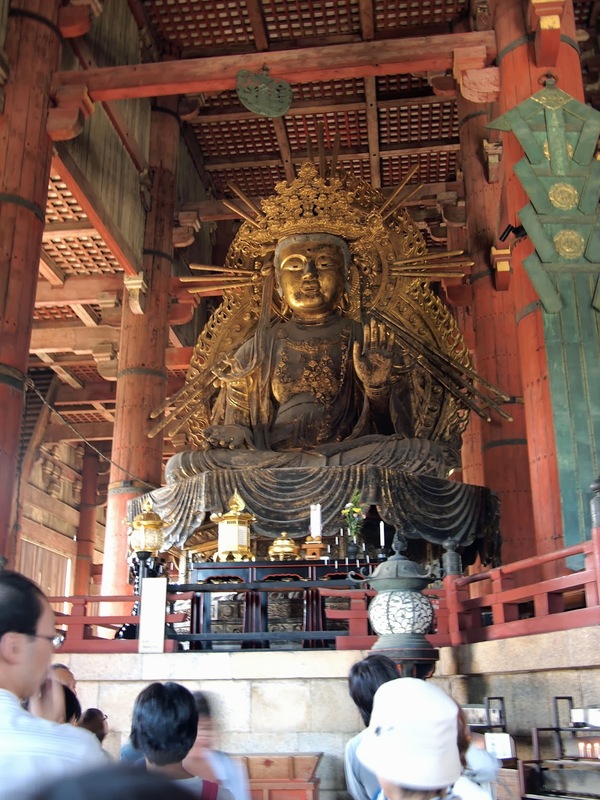 Inside is the "Daibutsu" or "Big Buddha", the Virocana Buddha. 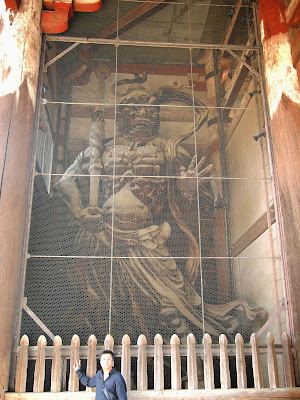 He's almost 50 feet tall and takes up the majority of the room. 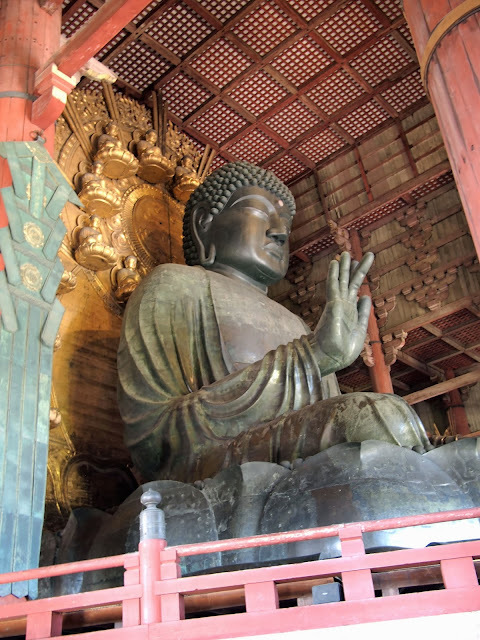 He's flanked on either side by slightly smaller, but still pretty imposing Buddhas. 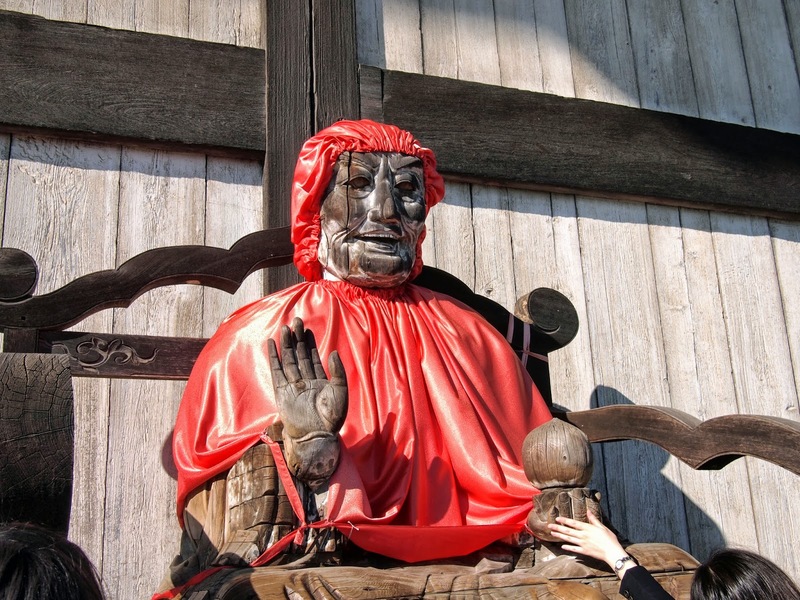 On your way out, be sure to rub the rather creepy wooden Buddha outside for good luck. 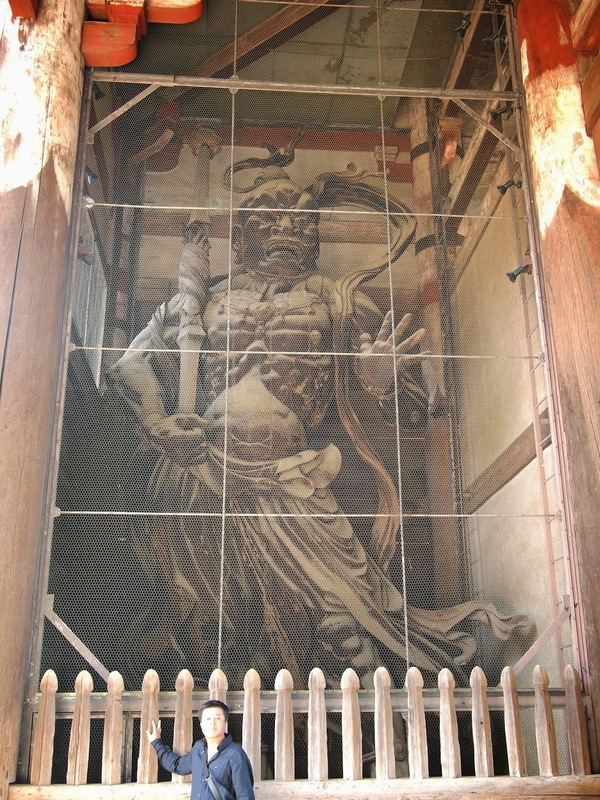 Unfortunately, there was a bit of scaffolding up as they were getting set up for a special event. Luckily, this wasn't the first time I have visited Nara, so I have photos of what it looks like sans scaffolding! 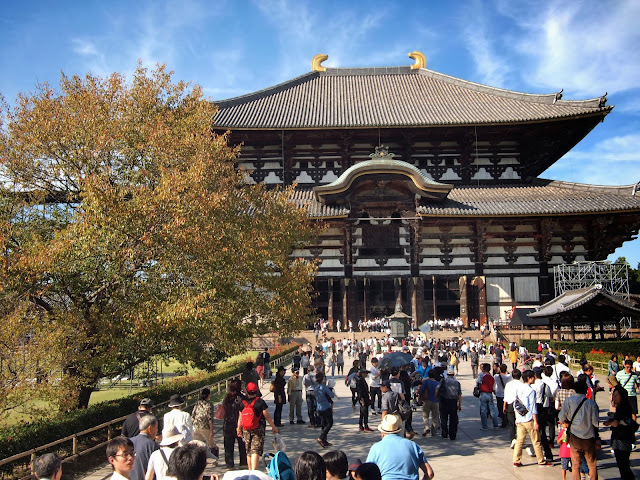 My day didn't end there, but today's post does :) Stay tuned for more of my day in Nara!